The BOD2 printer .... undergoing tests. Saudi-based Elite for Construction and Development Company has placed an order with Danish Cobod International for the supply of the largest 3D construction printer in the world. The hitech BOD2 printer will be in the kingdom by the end of May. The giant printer, a first-of-its-kind, will be able to print buildings 12 m in width, 27 m in length and 9 m in height, and three-storey buildings of more than 300 sq m per storey could be made with the printer in one go. The company’s move comes at a time when the kingdom has set an ambitious target to build around 1.5 million private houses over the next 10 years under Saudi Arabia’s Vision 2030, which aims to improve the country’s economy and housing situation by applying more modern construction techniques in the country. Also some of the leading private companies and public organisations have expressed a strong desire to use the 3D construction printing technology in construction projects if provided locally by a Saudi company, says the company. 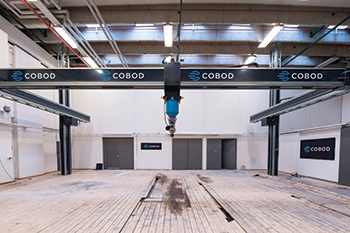 Cobod International has made the headlines quite a few times in 2017 and 2018 with its 3D construction printing activity and now releases the first news for 2019. Already last year it became clear that not only Dubai, where 25 per cent of all buildings by 2030 must be 3D printed, but also Saudi Arabia has big ambitions with the application of 3D construction printing, he states. “A small private house was 3D printed in Riyadh at the end of 2018. Now, multiple public and private organisations are requesting the use of the 3D construction printing technology in new construction projects, as soon as the technology is available locally on a permanent basis,” he explains. “This will bring costs significantly down compared to temporary imported printers using foreign-made materials,” states the official. “Also with the 3D construction printing technology, we will be able to do projects almost impossible with conventional technology, and we will build faster and cheaper than before. At the same time, we decided to invest in a very large printer, such that the scope of projects we can carry out will be as big as possible,” notes Al Shathri. “When compared to the BOD building we did, it is clear that Elite for Construction and Development Company is taking 3D construction printing into brand new territories,” he notes. “With this printer they will be capable of gaining a leading position not only for the 3D construction printing of private houses, but also for medium-sized offices and public buildings like museums and schools,” he adds.